Most people all over know the story of Hachi, the loyal Akita dog that waited for his owner long after he had passed away. Many visitors to Japan go see Hachi's statue at Shibuya Station. If you aren't familiar with Hachi's story, let us shortly introduce it to you. One morning in May 1925, Hachi accompanied professor Ueno to the Station as always but Ueno wouldn't return that afternoon. He suffered a brain hemorrhage at the university and passed away. Not aware of his owner's passing, Hachi kept returning to Shibuya Station every day to wait for him. People tried to take Hachiko in but he kept breaking free to go to Shibuya Station. Finally, he settled in the home of Ueno's former gardener close to Shibuya Station. However, this didn't stop him from going to Shibuya Station every day at precisely the time his owner would normally return. The station staff and some local residents actually weren't happy about the "stray dog" lurking around the station and tried to chase him away many times. But nothing could stop Hachi from returning every day to wait for his master. He became famous after one of professor Ueno's former students heard of Hachi's story and wrote about him. Hachi was even designated a national icon of loyalty after his story was published in the early 1930s. People added the "ko" (A word expressing affection) to his name in recognition of his loyalty. This he is nowadays known as Hachiko. Now, let's see some of the places that are related to Hachi. Hachi's famous bronze statue is located right in front of Shibuya Station's Hachiko Exit which was named after him as well. But did you know that this is not actually the original statue? The original statue was revealed in 1934, one year before Hachi's death. Hachiko himself had been present when the statue was revealed. However, the original statue was melted and recycled in the war efforts of WWII. And if you enter the underground passage beneath the statue, you will find dog paw prints all over the floor. These are supposed to represent Hachiko's paw prints. 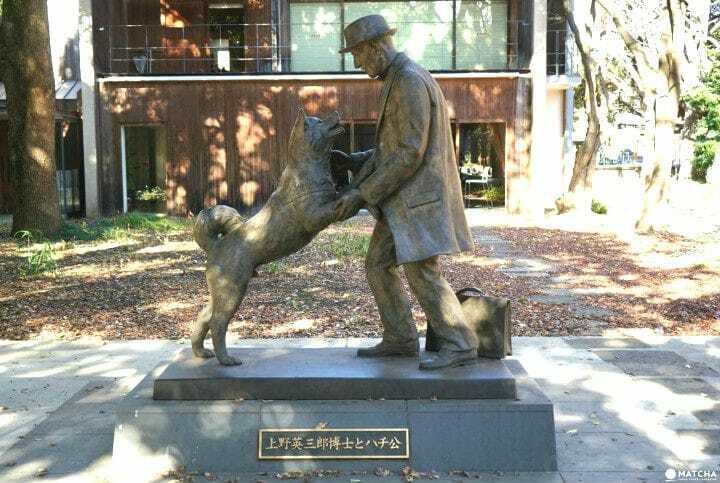 In 2015, the University of Tokyo revealed a statue in honor of their former employee and his famous dog. 2015 was the 80th anniversary of Hachi's passing. In Japan, 80 is pronounced hachi-juu, so it was a special year for Hachi. The statue is located right beside the No-Seimon Gate of the Hongo Campus, which can be easily accessed from Ueno. For details, please refer to this convenient map of the campus. A little-known fact is that the archive museum of the University of Tokyo's Faculty of Agriculture displays some of Hachi's preserved organs as well. Hachi was dissected after his passing. His organs where actually re-examined in 2011 to investigate the cause of his death. If you are interested, feel free to visit the museum and have a look. You might be surprised to know that you can find the real Hachiko at the National Museum of Nature and Science in Ueno. Many people stroll past him without even recognizing him. The plate just reads "Akita dog (Hachi)", so you might just think that the taxidermy displayed with two other dogs is just a random Akita dog like Hachi. But it is actually the real taxidermied body of the loyal Hachiko! Burying animals at a human cemetery is not very common in Japan. However, in Hachi's case, there seemed to be no other appropriate way after his passing. He needed to be reunited with his beloved professor Ueno after he waited 10 years for this moment! So an exception was made. He was cremated and laid to rest beside his owner in the Aoyama cemetery. Aoyama cemetery is especially beautiful in spring as it's a famous cherry blossom viewing spot as well. Business Time Open all day. Fixed holidays There are no fixed holidays. Required Time About one hour. Access Seven-minute walk from Gaienmae Station. Ten-minute walk from Nogizaka Station (Tokyo Metro). Nine-minute walk from Aoyama-itchome Station (Tokyo Metro and Toei Line). Odate is a great place to visit if you like Hachi and dogs in general, not to mention that Akita itself is an area with beautiful natural scenery and many other chams. Hachi's story of loyalty and love never fails to touch hearts and he will never be forgotten. His legacy has been kept alive in literature and movies all over the world. We introduced you some of the places which are helping preserve his memory. How about exploring the true story of Hachi yourself by visiting some of these places? The National Museum Of Nature And Science In Ueno. Learning Is Fun!